Mexico Registers Its Highest Number Of Homicides On Record : Parallels The country racked up nearly 30,000 homicides in 2017, the most since it began reporting the statistic in 1997. But that doesn't make it the "most dangerous" country as President Trump claimed. 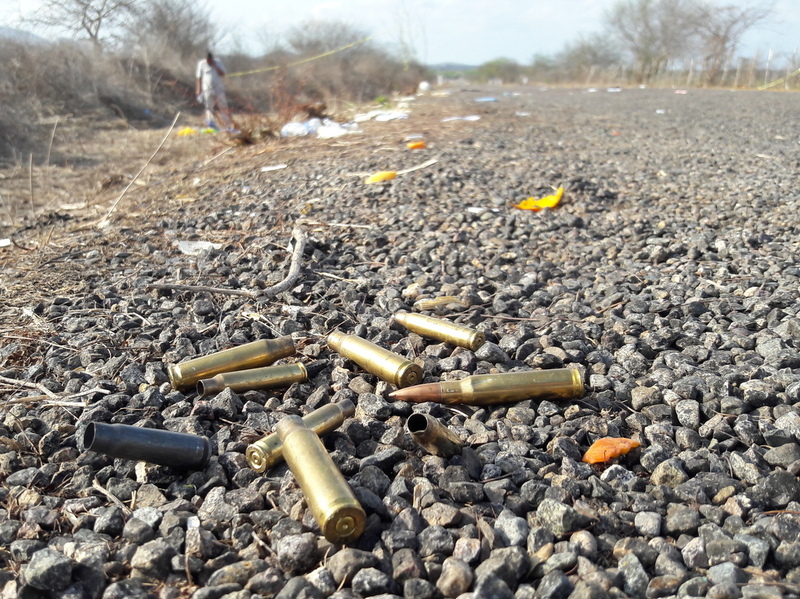 Spent bullet casings litter a road after authorities reported a gunbattle outside Mazatlan, Mexico, in July 2017, a year marked by the highest homicides in at least decades. More than a decade after Mexican soldiers deployed in the streets and mountains to fight a U.S.-backed drug war, Mexico has something to show for it: more killings than ever. Mexico recorded 29,168 homicides last year, according to preliminary government data published this week. While the tally won't be finalized for several months, security experts are already certain the 2017 figure will mark the country's highest murder rate at least since official statistics began in 1997 — and potentially the highest in the nation's modern history. "It comes back to a failed security strategy that has been completely exhausted," says Francisco Rivas, director of the Mexican research group the National Citizens' Observatory. The Mexican government has so far not commented on the statistics. High as they may be, however, the new figures don't square with President Trump's tweet on Jan. 18 about the extreme state of violence in Mexico. There is no metric by which Mexico could be considered the "most dangerous country in the world." Figuring out the deadliest place on the planet is tricky: Some countries don't release comprehensive numbers, citizens don't always report killings, and police don't always investigate them. Ongoing wars in countries like Syria add a host of other complications. Another metric could be the Global Peace Index, a study by the Institute for Economics and Peace, a Sydney-based think tank that grades countries on additional factors like access to firearms, victims of internal conflicts and citizen perception. Of 163 countries studied, 21 were considered less peaceful than Mexico in 2017. Still, the country's levels of violence have sparked serious concern in Mexico and abroad. The State Department's most recent travel advisories for American citizens list five of Mexico's 32 states under "Do Not Travel," while several other areas receive lesser warnings. NPR requested comment from the U.S. Embassy in Mexico, but it did not respond during the recent U.S. government shutdown. While hundreds of U.S. citizens have been killed in Mexico in the past decade, it remains a popular travel destination, and number crunchers have questioned how accurately the advisories reflect the risks for visitors. Yet Mexico's true crisis of violence may be worse than the government officially reported. "It's very likely that the number of homicides [in 2017] is actually around 32,000," says José Antonio Polo, director of the public safety watchdog Common Cause. "So the bad news isn't that the current number is the highest ever — it's likely to get even higher." Polo explains that the country's recent annual homicide totals, as counted by the Department of the Interior, increased by roughly 10 percent after being analyzed by the national statistics agency, which includes killings that went misclassified or unreported. More details will likely come out in analyses of the final death toll. But some trends are already clear. On the whole, homicides increased throughout the year. In the first quarter of 2017, there were an average of 72.3 homicides per day. By the last quarter, it had increased to 86.4 a day. "It's very likely we have not hit the peak of violence yet," adds Polo. One of the scariest trends in Mexican violent crime is its ubiquity: Killings increased in 28 of Mexico's 32 states last year. Crime isn't just happening in traditional cartel hot spots. One explanation for this comes from a study claiming the number of identified organized crime groups in Mexico has grown from six to more than 400 in the 10 years since Mexico officially launched its drug war. Last year's killings even surpassed the previous peak violence of 2011, a notorious year in Mexico's bloody drug war that inspired grisly films like Hollywood's Sicario. In 2011, the border town of Ciudad Juárez was considered the world's murder capital, where cartels left bodies of their mutilated victims in public. While battles between cartels that service America's drug habits undoubtedly contribute to rising crime, security analysts say weaknesses in law enforcement are at the heart of Mexico's backslide into its most violent year on record. "We're not going after financing of organized crime, we're not going after arms traffickers, and authorities at every level of government are failing in criminal justice and crime prevention," says Rivas of the observatory. Other crimes like extortion, armed robbery, auto theft and pedestrian assaults saw double-digit increases in 2017 from the previous year. A study by Polo's Common Cause showed not a single police force in Mexico met legal standards for training, professionalization and equipment. While government spending on police has risen over the last decade, cops' wages are still meager. Poorly paid police are targets for corruption, analysts say. And while Mexico has made significant reforms to its criminal justice system in recent years, roughly 4 out of every 5 homicide cases still go unsolved. More than 90 percent of all crimes go unpunished, according to the think tank Zero Impunity. It's very likely we have not hit the peak of violence yet. The U.S. also plays roles in Mexico's violence — and not just because of Americans' voracious demand for the heroin, cocaine and methamphetamines that Mexican cartels traffic into the country. "The issue that has not been addressed in the last few years is the continued flow of U.S. arms to Mexico and the ease with which you can buy firearms in the U.S. that are fueling violence in Mexico," says Maureen Meyer, senior associate for Mexico and migrant rights at the Washington Office on Latin America think tank. From 2009 to 2014, more than 70 percent of arms seized by Mexican authorities originated in the U.S., according to a congressional report. An estimated 253,000 firearms cross from the U.S. to Mexico every year. In 2017, murders with a firearm increased 35 percent. The U.S. government has spent $2.5 billion since 2008 to help Mexico break up organized crime and bolster its rule of law. But now cooperation between the countries seems to be shifting priorities. "What we're seeing from the current U.S. administration is more of a focus on eradication of drug crops to address the U.S. heroin issue, and that is going to have little or no effect on violence in Mexico," Meyer says. The 2017 murder rate will likely be a hot political issue in the months to come: In June, Mexicans will elect a new president and candidates won't be able to ignore the country's crime problems. But there isn't much optimism among voters that a new president can fix them. "No candidate has put forward a substantive reform plan for our police," says Polo. "As long as we don't see something like this, how can we expect anything to change?"